John Paxson was born in Dayton, Ohio in 1960. He played basketball through college at Notre Dame where he earned his first All-America recognition as a junior in 1981-82. Paxson received his second All-American selection in his senior year. During his four years at Notre Dame he helped lead the team to NCAA appearances in 1980 and 1981. Paxson is one of only four basketball players in Notre Dame’s history to earn Academic All-America acknowledgments on more than one occasion. After college, Paxson was picked 19th in the 1983 NBA Draft by the San Antonio Spurs. Paxson played two seasons with the Spurs before he signed with the Chicago Bulls where he played alongside Michael Jordan. 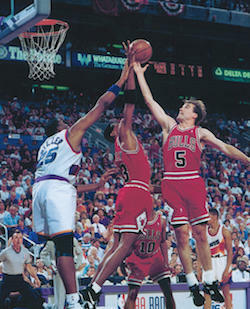 In 1993, Paxson made the winning 3-point shot during Game 6 of the NBA Finals, giving the Bulls their third consecutive NBA Title. After his retirement, Paxson joined the Bulls coaching staff as assistant coach, but quickly resigned to join Neil Funk on radio broadcasts. In April of 2003, Paxson left his job at the radio and went back to the Bulls to become Vice President of Basketball Relations. In June 6, 2005, Paxson was inducted in the College Sports Information Directors of America Academic All-America Hall of Fame, along with five other celebrities.